She’s the first Holmes family member to serve as mayor since the city incorporated in 1950. Mayor-elect Judy Holmes Titsworth swept away her opponent in the Nov. 6 election, taking more than 79 percent of the vote — a likely record for a contested Holmes Beach mayoral election in the city. The Manatee County Supervisor of Elections Office was prepared to certify the results of the race Nov. 18 with the rest of the county election after a 10-day period allotted for counting overseas ballots. However, certification is likely delayed by a statewide recount. “It won’t change the outcome” in Holmes Beach, according to SOE deputy chief Sharon Stief, who said the margin is so wide, the ballots postmarked prior to Nov. 6 that have yet to be counted, if any, are unlikely to make a dent. City clerk Stacey Johnston said she would swear in Titsworth and the other Holmes Beach election winners. 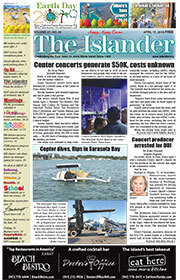 The ceremony was scheduled for Nov. 19, at city hall but, at press time for The Islander, it was postponed to Nov. 26. Johnston issued a notice Nov. 9 providing that a statewide recount of ballots could delay election certification by the SOE. The swearing-in will now be at 9 a.m. Monday Nov. 29 at city hall. Titsworth’s win was by the biggest margin Johnston recalls, including those of past mayoral wins by Carmel Monti, Richard Bohnenberger, Carol Whitmore and Pat Geyer. She outpolled her opponent, Joshua Linney, by 1,587 to 415 votes, according to the unofficial tally reported Nov. 9 by the Manatee County Supervisor of Elections Office. Titsworth is a three-term commissioner who served as chair since 2013. “I would like to think it is because I have worked so hard for the past six years,” Titsworth said about her landslide victory. Titsworth, who operates a construction business with her husband, said her first order of business is to improve the building department. She said Nov. 7 the department — comprising of building official Jim McGuinness, three plan reviewers and support staff — has recently become more responsive but, in the past year, builders have complained of overreaching, unfairness and long permit holdups. “Yes, we want good inspections. Yes, we want to make sure they’re meeting codes,” but without a “bulldog mentality,” Titsworth said, adding the department should not unnecessarily hold up projects. “I’ve already heard from contractors, they’re pleased” about recent improvements, she said, adding builders must become more accurate in reporting their costs, which correspond to the fees for a permit. Linney conceded defeat on election night. “It was a great experience,” he said of his run for mayor, adding he expects to run again. Linney’s campaign was marred by revelations of past drug use, arrests for driving under the influence and theft, as well as untrue claims he made about his military service. Of the 2,810 registered voters in the city’s two precincts, 2,113 voters — including 886 by mail and 233 early voters—cast ballots in the election, according to Nov. 8 county records. County records showed 3,029 registered voters in 2014. The mayor’s position pays $1,000 per month. Titsworth succeeds Mayor Bob Johnson, who defeated former Commissioner David Zaccagnino in his first bid for the position in 2014. The committee recommended the change to weak mayor and city manager, in lieu of the current administrative mayor, overseeing the day-to-day operation, hiring and firing of city employees — a recommendation that stalled in August with the city commission. Commissioners disbanded the committee without taking a vote on its recommendation, opting to defer the decision to a duly-elected charter review committee, which led to a slate of candidates from the committee and others. “I’m really happy with the outcome of the charter review committee,” said Titsworth on learning city voters chose Sean Murphy, Nancy Deal, David Zaccagnino, Claudia Carlson and Ed Upshaw to undertake the review. Titsworth has been outspoken against the switch to a city manager as costly and unnecessary. “It’s a mix. It’s not everyone on that postcard” who ran favoring the city manager, Titsworth said, adding she expects an unbiased, comprehensive charter review. No comment about what the new mayor is going to do about Red Tide. I am a new tourist bringing my family for the first time. Will be the last if no action is taken to stop the source of Red Tide. We all know the source and have for years. Amazing the tourist dependent cities in Florida are taking no action but cleaning-up the beaches. Talk about sticking your head in the sand. Sand that soon fewer and fewer will want to visit. Hey Mayor, some reason you couldn’t find a place to celebrate in Holmes Beach? 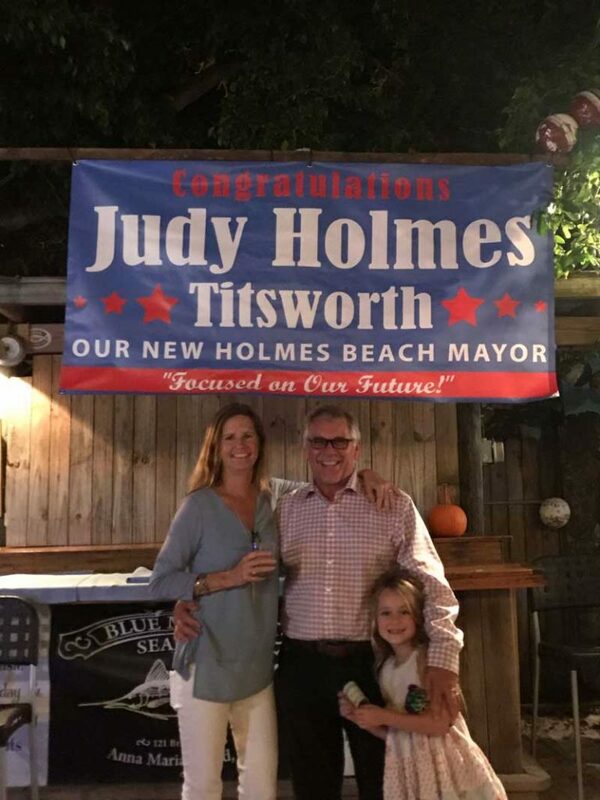 Judy Titsworth’s election is the best thing that ever happened to the City of Homes Beach. Many caring residents have served as Mayor in the 32 years plus I have lived here. They were certainly not politicians as we have come to know them and each provided selfless, dedicated service to a growing city. The recent push for a city manager/weak mayor form of government is likely born of the frustration many residents have dealing with a system that can no longer be sustained by well meaning leadership but with a lack of experience in public administration at this level. The newly elected charter review group studying the city manager issue has been dealt an Ace. There is no longer a “this is a pressing emergency – do something – anything” mentality which is good because we have seen what that can lead to. Judy Titsworth is uniquely qualified to work with city officials throughout the process while stepping in immediately to correct, streamline, improve and create a better serving, more efficient city government. Judy is an experienced business woman, familiar with managing large projects in the millions of dollars. For many years she and her husband have owned and operated a very respected and successful company hired by others to provide management services. She is skilled with scheduling, budgeting, efficient production, quality and the bottom line. She recognizes taxes, regulations, profit and loss and the value of a happy client with a job well done. Judy is a team player who manages group achievement without having to use a heavy hand. But make no mistake – if she needs to step up on our behalf she will be formidable and I would bet on her to prevail. On the personal side she is quick to smile, knows the value of treating others the way she would want to be treated. She has been a hands on, life long champion of wildlife and a staunch protector of the island environment. She is family oriented and has a personal stake in what happens in Holmes Beach because of her life long residence there and her membership in the family who founded it. I’ve known her a long time and have worked with her officially, personally and professionally. I know firsthand what she is capable of and committed. As long as she is mayor we get everything a city manager can provide and a whole lot for for $1,000/month. 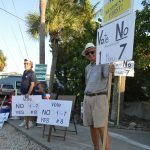 If or when the time comes for a city manager, a decision to be made by the charter review committee, the commissioners and mayor, the City of Holmes Beach will be in excellent condition for ongoing management and leadership because of the decision the voter’s just made to elect Mayor Titsworth. It is so great to see democracy work the way it’s supposed to!